Coca-Cola says it's celebrating diversity in its upcoming Super Bowl ad, carrying on the tradition of its iconic "Hilltop" commercial from 1971 that was featured in the TV show "Mad Men." Coca-Cola's spot, called "The Wonder of Us," depicts people of different races and religions drinking Coke and having fun. In one scene, the spot briefly shows an interracial couple lying on a beach. "The spot articulates Coca-Cola's values of optimism, togetherness, diversity and inclusion," says the company in a statement. The company's famous "Hilltop" ad, which appeared in the final scene of the "Mad Men" series, depicted a crowd of people of different races, from different countries, singing "I'd like to buy the world a Coke." The new ad echoes that theme in a poem, which has the line, "There's a Coke for we and us, and there's a Coke for you." A spokeswomen for Coca-Cola (KO) said the company wasn't necessarily making a political statement about the current state of affairs in America, noting that diversity has been a theme in Coke ads for decades. The company is airing the one-minute spot during the fourth quarter of the Super Bowl on Sunday, when the New England Patriots take on the Philadelphia Eagles. The company is also screening a half-minute Diet Coke ad during the game. 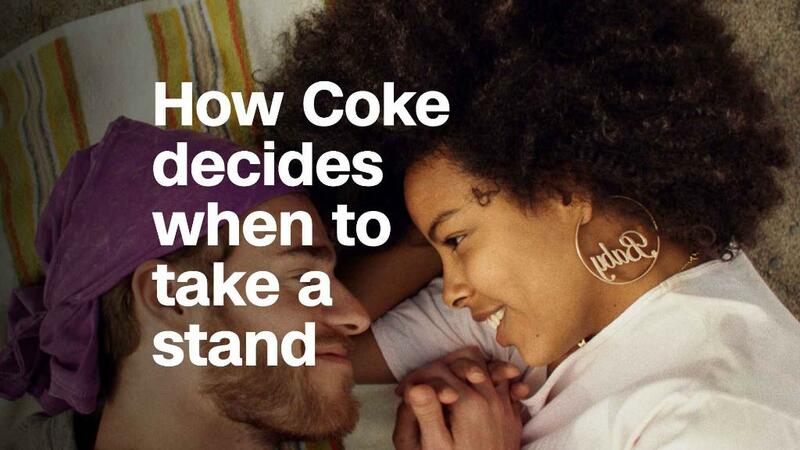 Coca-Cola's upcoming Super Bowl ad features an interracial couple. This marks Coca-Cola's 12th consecutive Super Bowl. This year, NBC is charging an average of more than $5 million per 30-second spot, an all-time high. Coca-Cola is also showing the Super Bowl ad on its YouTube channel starting on Thursday. "As a strategic media choice, we don't want to limit the viewership when there's another one billion views in the world," said Brynn Bardacke, vice president of content and creative excellence, when asked why Coca-Cola is showing the ad for free ahead of the game.